Potluck dinners are a great way to get together with friends and family in a casual atmosphere. However, finding something to bring that appeals to everyone, and that can withstand the transportation, can take some thought. Consider using one of these potluck dinner recipes the next time you're invited to bring something. These recipes travel well, don't require reheating once you arrive, and are sure to please a variety of palates. 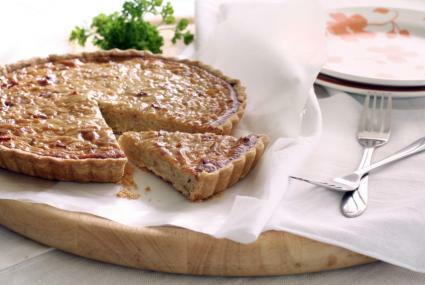 This savory tart tastes just as good cold as it does hot. Bring it straight out of the oven in an insulated bag, or make it ahead of time and bring it chilled. Prepare the pie crust and line a pie tin, or thaw a frozen pie shell. Set aside. Cut the bacon into 1/2-inch pieces. Slice the onions into strips. Cook the bacon in a frying pan until crisp. Remove and set aside. Sauté the onions in the bacon grease until they soften and caramelize, which will take approximately 20 minutes. Combine the ricotta, egg, cheese, salt, and pepper in a small bowl. Spread the ricotta mixture onto the bottom of the pie crust. Combine the onions and bacon and spread them over the ricotta mixture. Bake at 350 degrees for approximately 40 minutes, or until the crust is golden brown. This simple side dish or appetizer can be easily converted to a main dish by adding cooked, shredded chicken. Bring some corn chips to serve alongside it. Open and drain the black bean, garbanzo bean, and kidney bean cans. Pour the beans into a large bowl. Add the corn to the beans. Dice the tomatoes, onion, and cilantro and add to the bean mixture. Sprinkle salt over the salad. Pour on the lime juice and stir well. Peel and dice the avocado and stir into the salad just before bringing to the potluck. 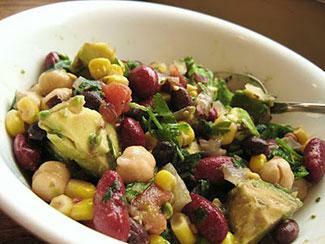 Serve as a salad, or with tortilla chips as an appetizer. Nearly any dish that travels and reheats well can be brought to a potluck. Try any of these recipe ideas for dinners, side dishes, or desserts to make your potluck contribution a success. Dips make a great appetizer for potlucks because they don't require heating and can be served with a variety of different finger foods. Make an easy dip recipe to bring along, like French onion or spinach and artichoke dip. Many heated dips taste just as good chilled as they do warm. Casseroles make a great addition to any potluck. Try this scalloped ham and potato casserole as a main dish, or bring something a little out of the ordinary with this seven layer taco casserole. 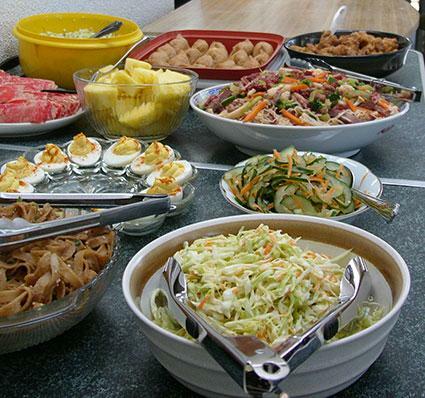 Side dishes at a potluck need to work with a variety of different dishes, while satisfying a variety of people. Make a delicious macaroni salad for a traditional crowd pleaser, or consider trying Spanish rice for a more unusual choice. It's hard to go wrong bringing a dessert to a potluck dinner. Pies, like this pecan pie, travel well and don't require garnishes or reheating once they arrive. If you're heading to an outdoor summer potluck, consider bringing a seasonal dessert, like a strawberry cobbler, instead. 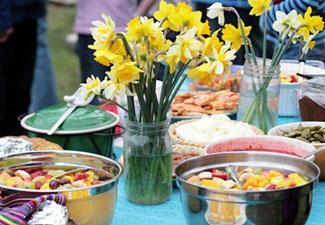 While every potluck may be a little different, the general idea and rules remain the same. Follow these tips to ensure that whatever you bring meets with success. Find out if reheating facilities will be available once you arrive. Alternatively, ask if outlets are available. Slow cooker recipes are good choices for heated potluck dishes. Heat the food thoroughly before leaving, and don't overfill the pot. Place in a box for transport. Invest in an insulated bag, like the kind pizza delivery drivers use, and pop any hot offerings into it straight from the oven before you leave. Bring your food in a disposable container, or in a dish you can gift to the host, to avoid having to come back for it later. Plan your offering around the event - cold salads are a better choice for barbecues and outdoor events than hot casseroles. Remember that the point of a potluck is to be an informal gathering of friends. Keep that in mind as you choose your offerings and you'll be sure to enjoy the meal.